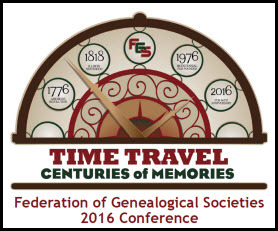 It’s FGS week, and The Legal Genealogist is frantically polishing images for the 40th annual conference of the Federation of Genealogical Societies in Springfield, Illinois. The conference gets underway Wednesday with Society Day — a full slate of lectures aimed at the many thankless tasks that society leaders and volunteers undertake and the skill set to help move the societies along. The general conference opens on Thursday, and there’s something for everybody during three full days of presentations on everything from local law to international research. Because this is the 40th annual conference, there will be a few special events during the four overall days of the conference — and other things to look forward to like the chance to get in on a raffle of a quilt that is absolutely stunning (with all the proceeds going to the Preserve the Pensions effort). So there’s an awful lot to be looking forward to. And, in case you hadn’t noticed, an awful lot for those who are interested in genealogy and the law (or law-related records). And remember: just because you’re tied to a job or housebound or have kids in school doesn’t mean you have to miss all the fun. There are recordings of some or all of the sessions from these conferences and events. I’ll have more on how to get in on that part of the conference later in the week.